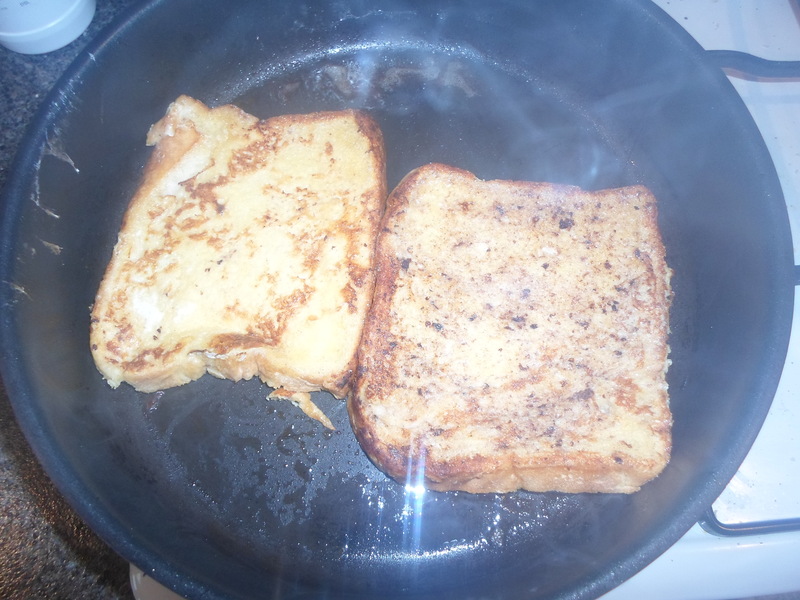 Before we begin, I know that I have posted about French toast before, and I know that this version is a little less traditionally sound, but I don’t actually care. In celebration of the end of Blogging 201, I decided to make myself a little celebratory breakfast, but you could also say that this meal was a self-congratulations on making it to the end of the week alive. The baguette being the exception, I don’t particularly fancy white bread – never have. And the sliced, white loaves that you find in French supermarkets are sickly sweet and dissolve in your mouth like fluffy plastic. That being said, I did buy a loaf for Bastille Day; I was making croquet-monsieurs and they do taste better with white bread. Since then, the half eaten loaf had slowly been pushed further and further into the dark depths of the back of the fridge, next to the shrivelled carrots and half-eaten tubs of unnaturally coloured yoghurt (both of which belong to my colocs, not me). 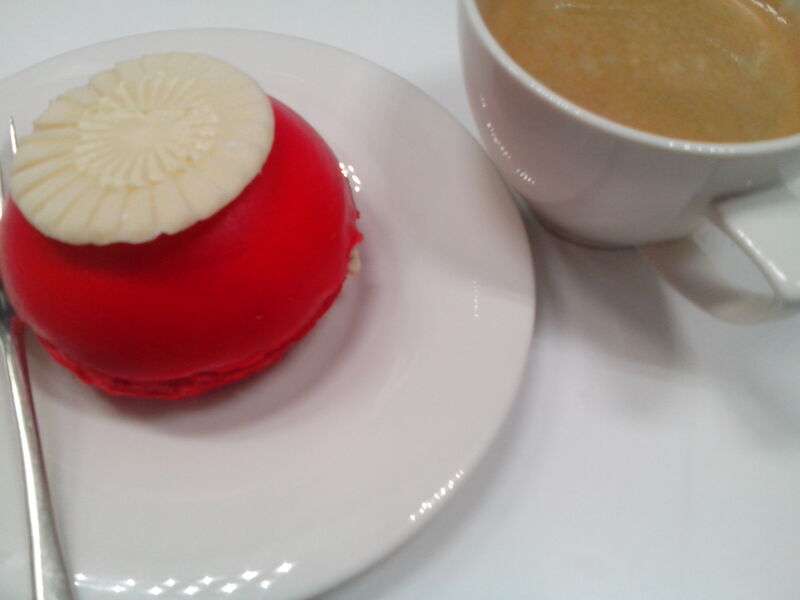 Not one to want to throw anything away, but also not being in a huge rush to eat it, I decided to treat myself. It all depends on the staleness of your bread, but I work off the ‘algorithm’ of one egg and one gulp of milk to every three slices of bread. Whisk the milk and egg together with whatever additions you fancy; cinnamon, cocoa, or nutmeg and soak the bread, on both sides until as much of the liquid is absorbed up as possible. Fry in melted butter until both sides reach the level of crunch that you so desire, use a medium heat to avoid burning and to warm the bread the whole way through. 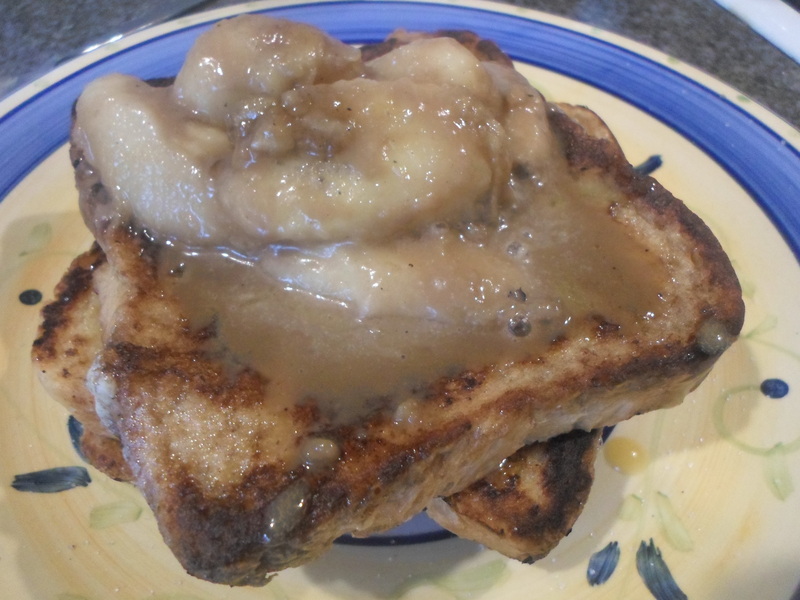 I lathered each slice with a healthy dollop of lemon curd, before topping with fried banana and a drizzle (more than a drizzle) of coffee cream sauce. If you freeze the banana before you fry it, the outside softens into a gooey, caramelised paste, but the centre remains cool and fresh with the flavour and consistency of banana ice-cream. 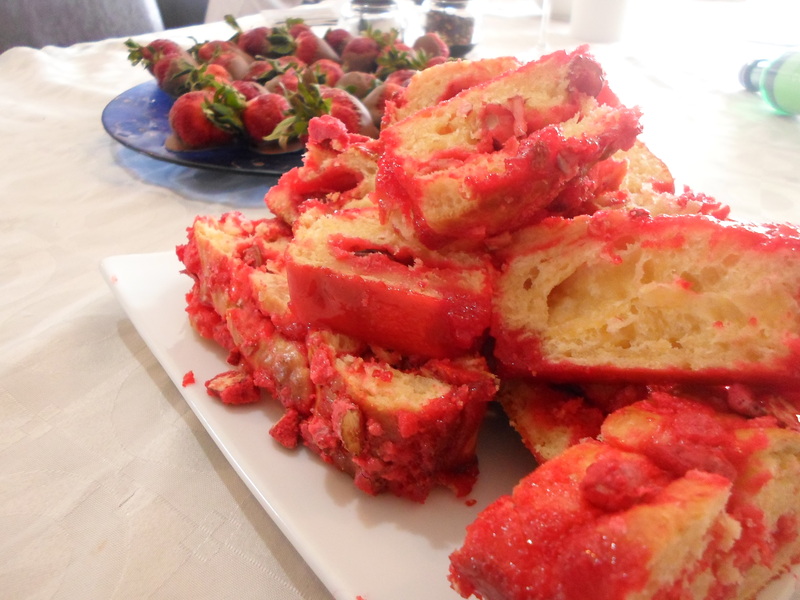 Even though French toast is generally considered a breakfast food, with this many elements I think it is socially acceptable to eaten any time of day. 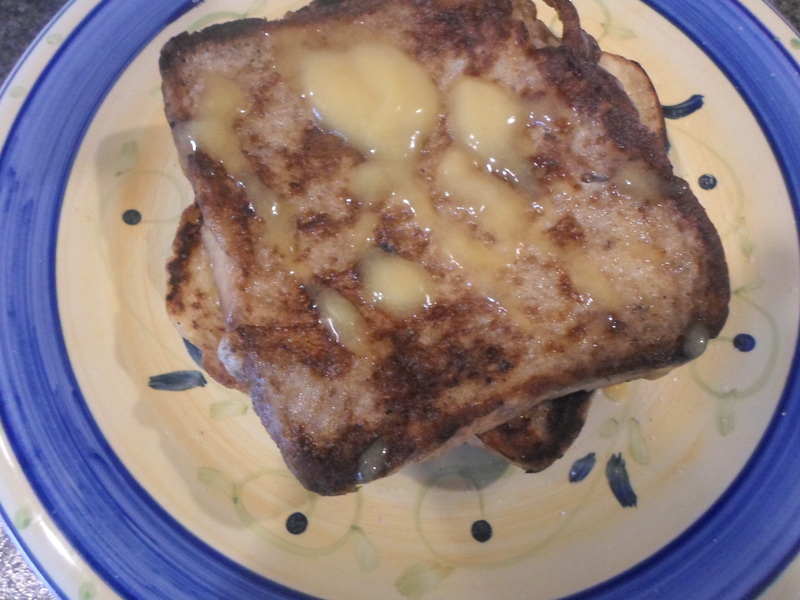 And anyway, as an adult, I don’t have to conform to social norms, I can do what I want – and if that means French toast for dinner, so be it! I hate pears. They are the only fruit that I don’t like, there is something about the inaudible lack of crunch as you sink your teeth into them that I find oh so unappealing. Subconsciously I associate them with pigs; as a child my cousins and I use to feed their pigs pears, catching them as they fell of a nearby tree when they were in abundance and throwing them into the pen. 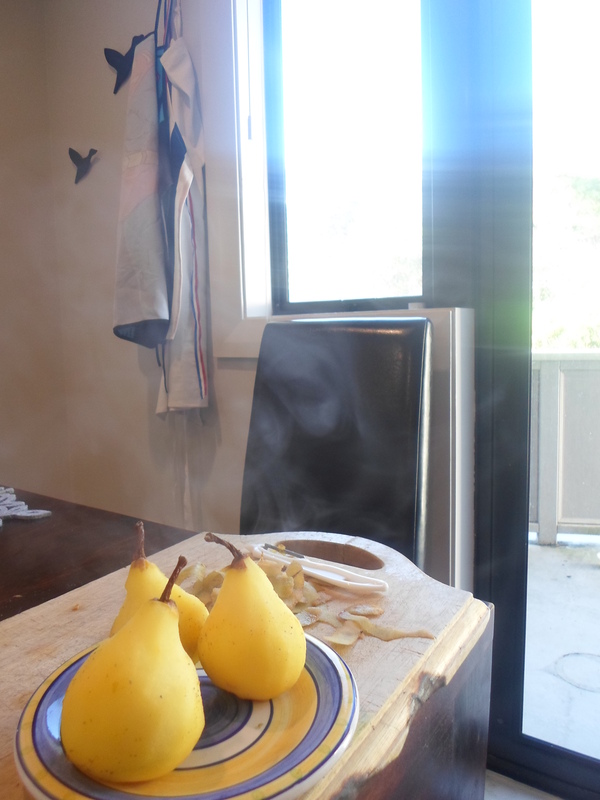 However, my distain of pears ends as soon as they are poached, when I think they are wonderful. Today’s recipe is the ultimate dessert in any weather, and anything drizzled in chocolate is fine with me. 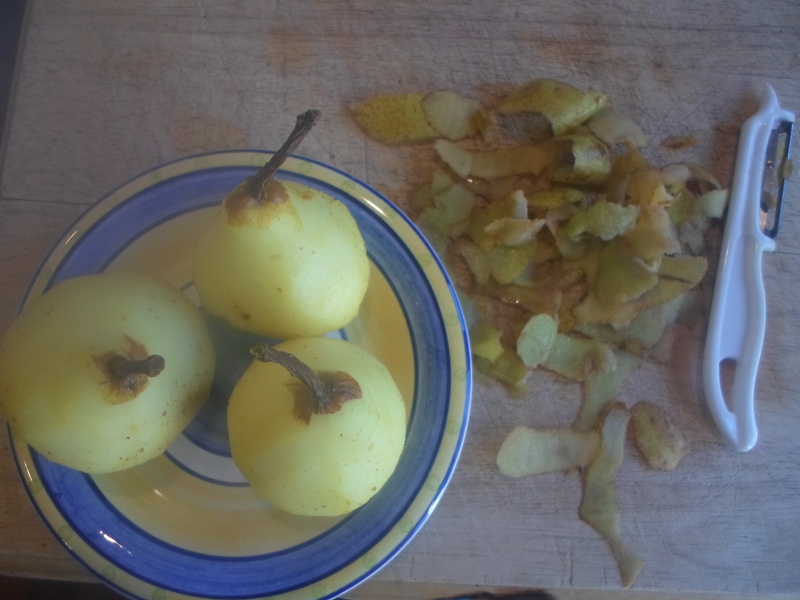 Poire belle Hélène are simple to prepare but will wow any guest with their elegance. Note: the elegance is only included if you are moderate with the chocolate drizzle, I am not. 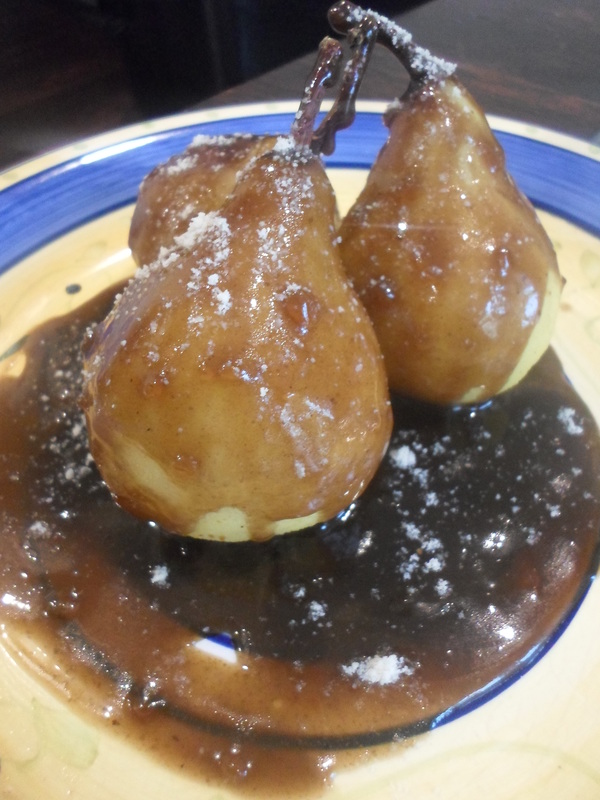 Traditionally in poire belle Hélène, the pears are poached in a simple sugar syrup, but I decided to get a little funky with it and poach mine in a chai infused syrup. Masala chai originates from India, it is black tea infused with a range of spices; these vary from place to place, but can include any of the following: ginger, cardamom, cinnamon, star anise, fennel, cloves, nutmeg, coriander, cumin and turmeric. I used ginger, cinnamon, fennel and coriander seeds, nutmeg, turmeric and cayenne pepper. Combine any number of the aforementioned spices in a relatively deep saucepan, the amount all depends on how many spices you are using, and how many pears you are poaching. 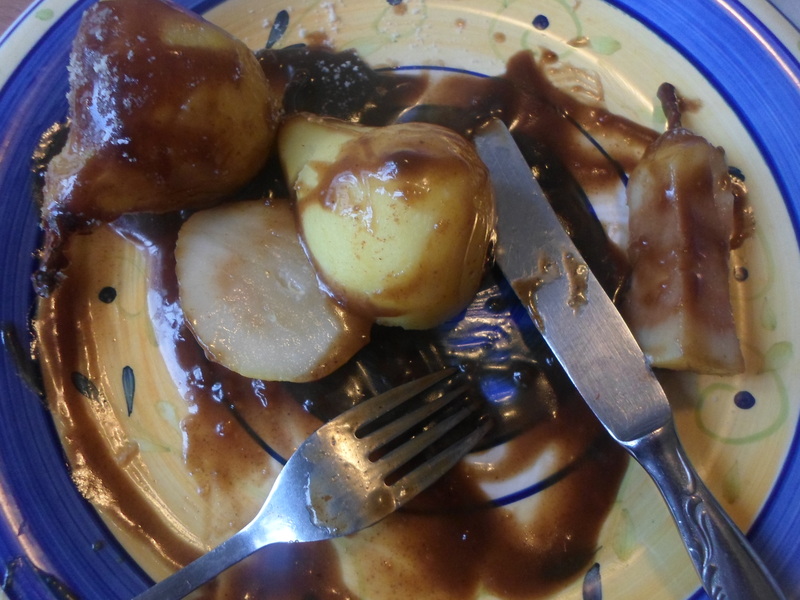 I used about half a teaspoon of each which was the perfect amount for three pears. Over a medium heat, lightly toast the spices; only about one minute or they will start to burn. Add 1/8 cup of sugar and ½ a cup of cold water for every three pears. If you don’t have the spices, or the time to collect them all, but still want the wispy chai flavours, you can add a chai teabag to water and sugar while the pears poach. Pears are generally an early autumn fruit, so the middle of summer is the perfect time for this recipe; if you can get your hands on some slightly under-ripe fruit, you can peel them without the juice running everywhere. Unfortunately I have no advise for peeling ripe fruit without creating a mess, sorry. Leave the stalks attached for presentation, and more importantly, easy handling. 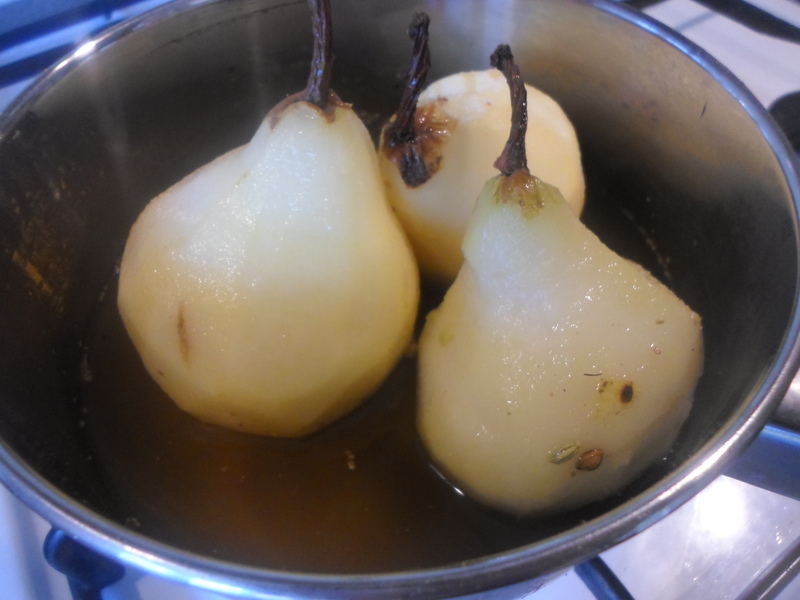 Once the sugar has dissolved, sit the pears in the warming liquid, cover and let simmer for 15-20 minutes. Check them sporadically; once a breadknife can slide into the pale flesh of the pear with little resistance, they are done. Fish each pear out of the syrup by the stalk and set aside to cool. In my opinion, they are better served cold, but if you are in colder weather, or just can’t wait, then they will be delicious hot too! Pears and chocolate make a great pair, pears and coffee are an even better match. To make the sauce, reheat the sugar syrup (strain it first to get rid of the spices), while the spices were infusing with the pears, the pears were infusing with the syrup, so the sauce will not only be speckled with pinches of spice, but will also have a lovely undertone of pear – so you could even save it and use it with something else. Once the syrup has heated, add ¼ of a cup of finely chopped or grated chocolate and stir constantly until melted. If you are a coffee nut like me, you can add a shot of espresso as well, or replace the chocolate with espresso sauce. Drizzle (or pour) the sauce over top of the pears, for an extra touch of elegance, dust with icing sugar, toasted almond flakes or ground almonds. Since arriving in France, my dependency on coffee has increased dramatically – last winter involved a self-enforced intervention when a colleague pointed out that I had guzzled a grand total of 10 (!) shots of espresso in one working day. Any French person will tell you that French coffee is one of the finest crafted beverages you will ever encounter, this is not the case. As a vase and wide spreading generalisation, I have found that the French often burn their espresso and boil their milk, and even though the standard is rather below par, I still enjoy wrapping my hands around a café allongé, imbibing the steaming, sweet aroma, or sipping a dark, smoky espresso after a meal. Like I said the other day, hot drinks in sticky weather aren’t the best combination, so I have had to get inventive in order to get my caffeine fix. This idea developed from an iced coffee; the obvious choice for a cold coffee craving, without all of the sugar and whipped cream that so many places add to it. My coffee sauce is strong and bitter, creamy with a real punch of flavour. I like my coffee strong, strong like the Italians drink it kind of strong, and I wanted this recipe to reflect that. I began with half a plunger of leftover coffee and slowly simmered it down to half a cup; a little time consuming but well worth it in the end. In a separate pot, combine 50grams of melted butter with 2 tablespoons of corn flour over a medium heat until it forms a thick paste that smells like baking dough; a good roux will help make your sauce full-bodied and thick. Whisk in ½ a cup of cream or condensed milk, whisking will help evenly combine the roux and aerate the mixture. Stir constantly over a low heat until it begins to thicken, then add the coffee. Continue to stir the mixture to avoid it boiling – this could lead to it splitting! How long you leave it really depends on how you like it, I kept mine relatively runny so that I could easily pour it over vanilla ice-cream but you may want to thicken it to make a dipping sauce or even the base of a cake icing. As the temperature creeps into the high 30’s, it is almost as important to keep cool as it is to keep hydrated. Even though I know it is so necessary, I always have a hard time forcing myself to drink water on days like these – be it lying on the beach or having a picnic in the park; no matter how cold your bottle of water is when you leave the house, it quickly becomes lukewarm and not I find that never quenches my thirst. I recently had a leftover pot of coffee – I had brewed it before remembering that drinking coffee in 30°C heat makes no sense, so I devised this little goodie with the leftovers; perfect for a cool afternoon snack on the balcony or a light dessert in the balmy evening air. I present you with my mazagran granita. 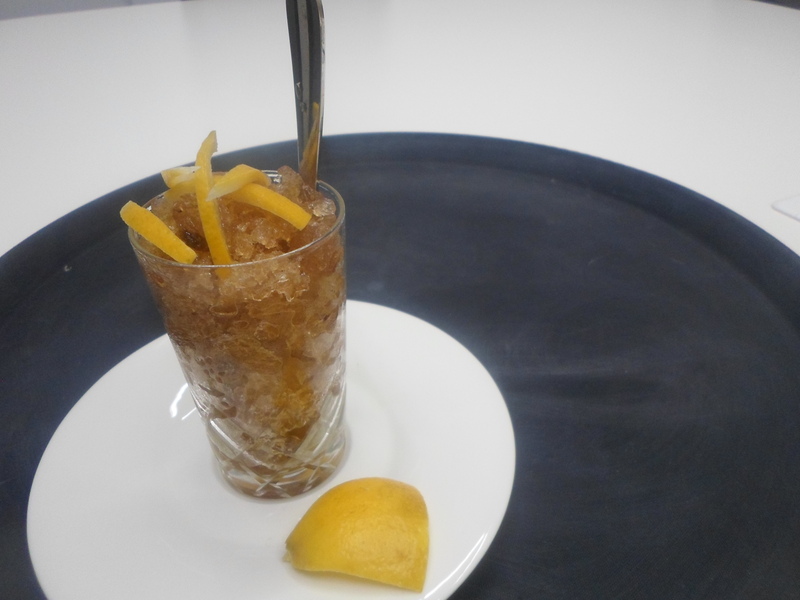 Mazagran is also referred to as Portuguese Ice Coffee, although it actually originates from Algeria. I first came across it while I was visiting Portugal last year, however I had been drinking a version of it for years prior, mazagran is essentially an Iced Americano served with a lemon wedge and a little more sugar than is socially acceptable to add to your coffee. 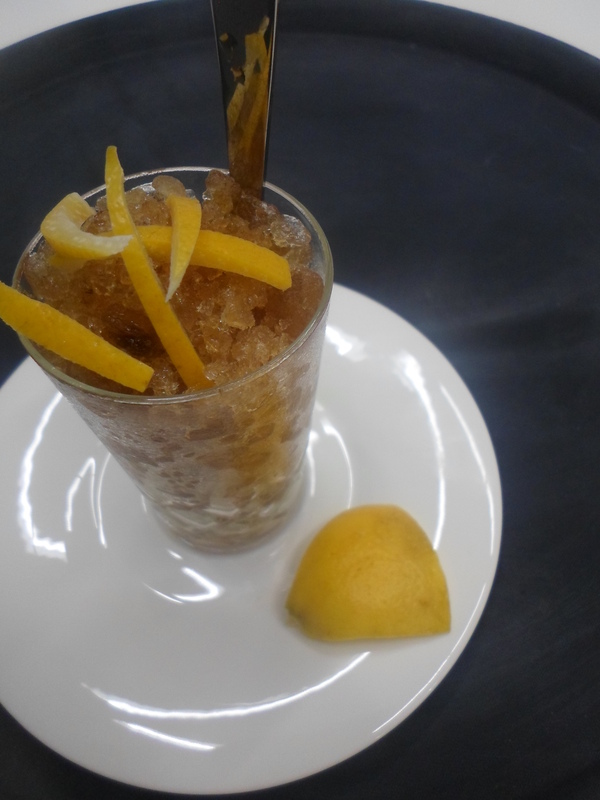 Such a refreshing drink, but I wanted to make it into an even more refreshing dessert – and what’s more refreshing than shaved ice?! It is by no means difficult to make, although it does take a bit of time and attention. 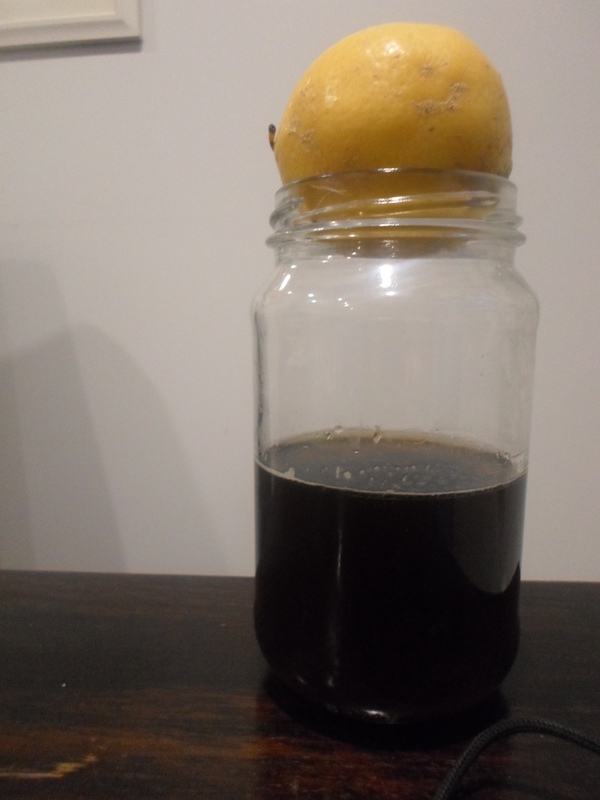 Mix half a litre of black coffee with 4 teaspoons of sugar and the juice of half a lemon. I used plunger coffee but you could also use 6 shots of espresso and add cool water to make up the difference. Leave it to cool before popping into the freezer. After 40 minutes, ice crystals should have begun to form around the edges of the bowl, break them up by mixing through the liquid. Repeat this step every 20 minutes as the mixture becomes mushy and thick, until the entirety of the dish forms thin, coffee-coloured shards of ice. Serve as is, or divide into parfait glasses or dessert bowls, top with candied lemon or a dollop of whipped cream. For an adult version, add a dash of dark rum before freezing and substitute the lemon juice for orange juice. Why, hello there, 2015! How are you? Exhausting, that’s how. We are a mere four days in and I already just want to curl up into a ball and sleep for a week. But seeing as that is not possible, I instead just daydream about all the delicious food I ate a Christmas-time. 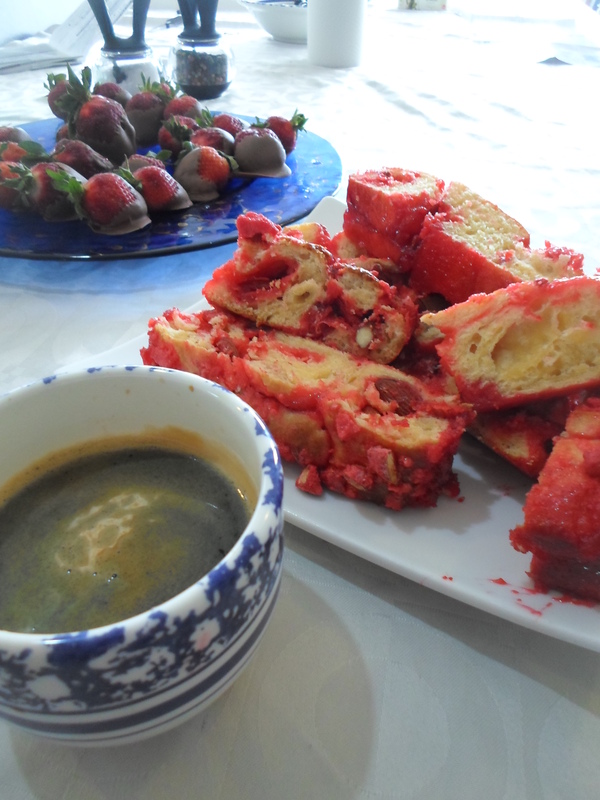 This year, Christmas breakfast was accompanied with homemade brioche laced with sugar-coated almonds. The morning was unusually humid so the dough didn’t rise as well as I would have liked it to, but it was still really delicious and rather easy to make. Easy to make and not too time-consuming, however, should not be thought as two of the same, especially in this situation. Regardless of when you want your bread to be ready, you will need to start the day before; the dough is best when refrigerated overnight. Mix your dry ingredients together before adding the milk and eggs. Use an electric mixer at a low speed for a couple of minutes before moving to a medium speed for another eight or so. 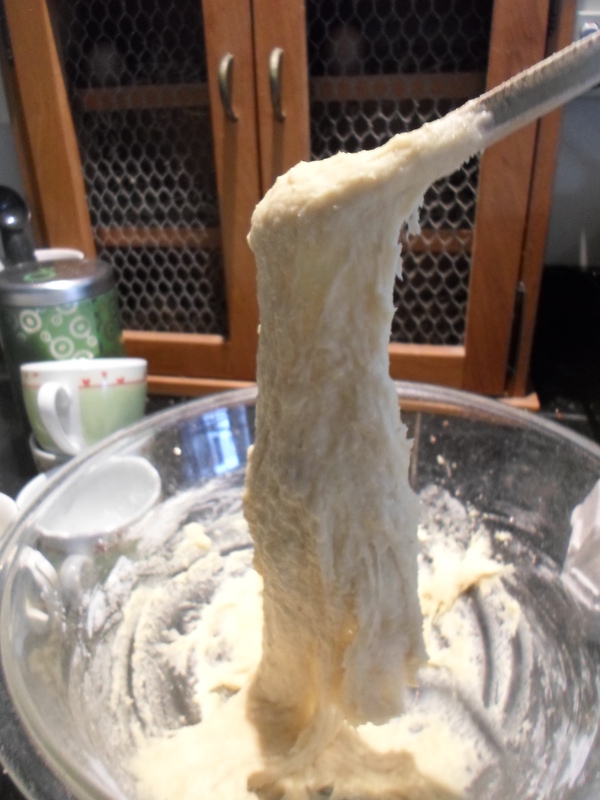 Or use your own arm strength like me until you have an elastic dough like this. Mix in the butter a cube at a time; I find that this way the batter is smoother. 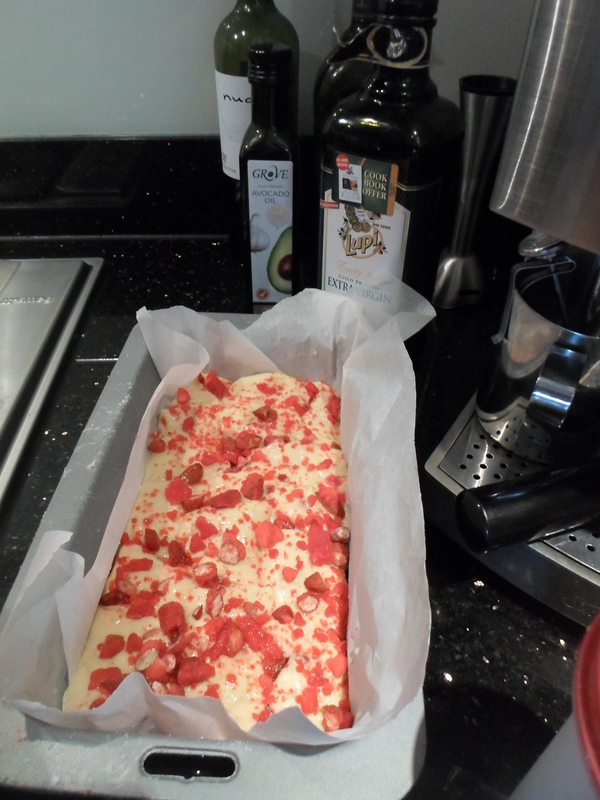 Cover the dough with cling film at chill overnight, if you cant wait that long, a few hours should suffice. Roll your dough out into a large square on a surface dusted with flour; it should be about a centimetre thick. Brush the dough with egg wash and cut into 16 evenly sized pieces. Sprinkle about two thirds of almonds overtop, fold each piece in half and arrange them in a loaf tin. Brush again with egg wash and sprinkle the remaining almonds overtop before leaving in a warm place for 45 minutes to rise. Bake for 30 minutes at 180°C or until you can poke a knife into it without any dough sticking to it. 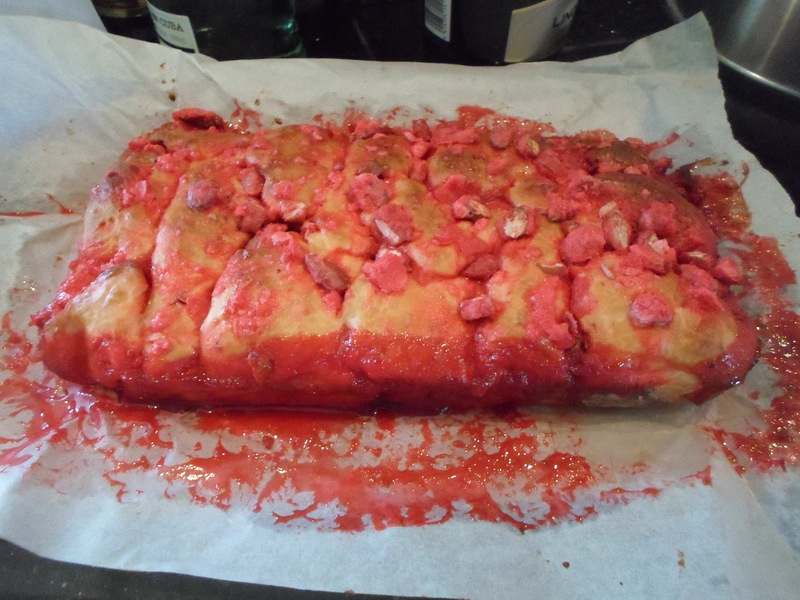 The food colouring used in the almonds will run through the dough as the sugar coating the almonds melts giving it a beautiful marbled effect. This is a perfect sweet snack to dunk into your coffee, and having divided the dough into pieces before baking, it is so easy to break into chunks and share with loved ones.